At Php 2,999, the Cloudfone Thrill Boost 3 is the cheapest smartphone with 18:9 aspect ratio, yet. We've seen tech giants like Samsung, LG, OPPO, etc., released 18:9 smartphones in their flagship portfolio, as well as in their mid-range offerings. These have been very well received by smartphone enthusiasts. Having an 18:9 screen, as compared to traditional 16:9 phones, enables easy grip and one handed usage. Likewise, it fits more contents on the screen, and allows you to have better experience when watching movies, as well as playing games. In the Philippines, brands like Cherry Mobile, OPPO, ASUS have released their respective mid-range smartphones that rocked the popular 18:9 display this year. However, we have not seen any smartphone that brings 18:9 into the entry-level segment until Cloudfone has given a sneak peak of their upcoming devices. 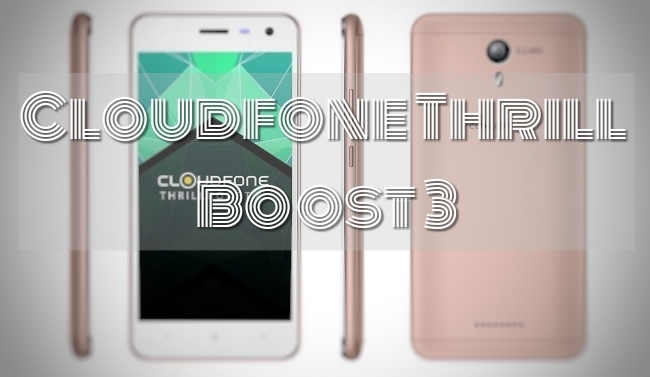 One of which, is the Cloudfone Thrill Boost 3. Cloudfone Thrill Boost 3 is pegged to sport a 5.5-inch 18:9 display at a very affordable price of Php 2,999. This will easily become the cheapest 18:9 smartphone positioned on the entry-level segment here in the Philippines. Cloudfone Thrill Boost 3 is expected to hit the shelves this weekend. In the meantime, check the specs below.